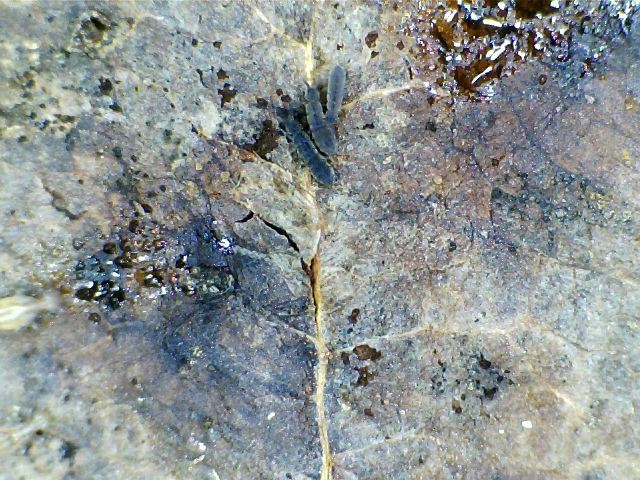 I have been gathering leaves from the garden and bringing them inside to look for springtails. I was enticed to give them some more attention after spending some time checking the awesome photographs of Eddy Nurcombe in Flickr. They transport you to a strange and tantalising world where everything is relative. Apparently gigantic millimetre long beasts with dark stern eyes tower over other bugs as big as a speck of dust. I wanted to have a glimpse by myself so, armed with the hand held digital microscope I set up to explore the leaf litter. 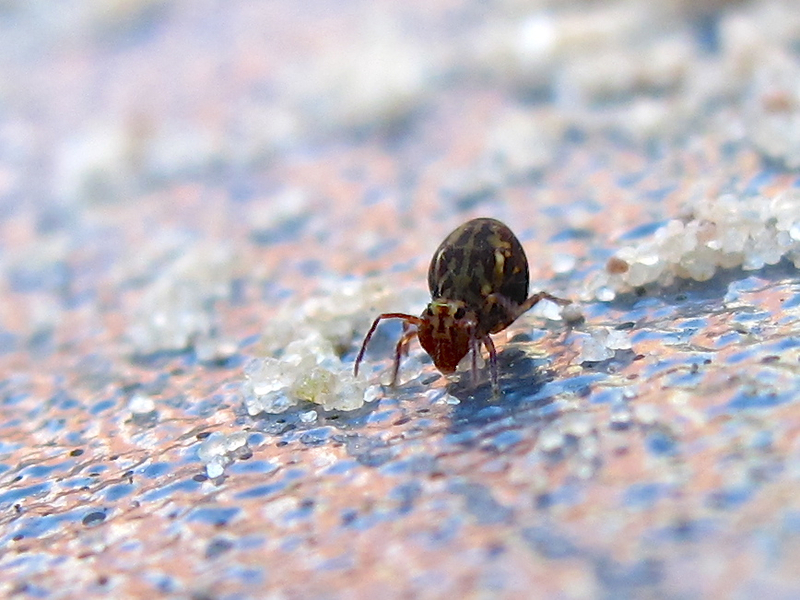 Springtails are a group of hexapods - as are insects - but, unlike insects, they are primarily flightless. 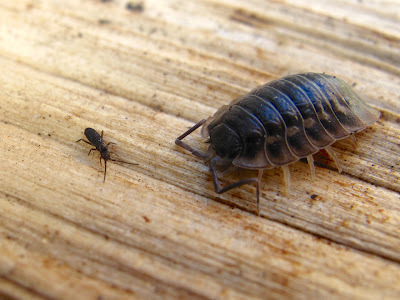 They still have six legs and a pair of antennae, like insects, but lack long cerci on their rear ends, like diplurans. 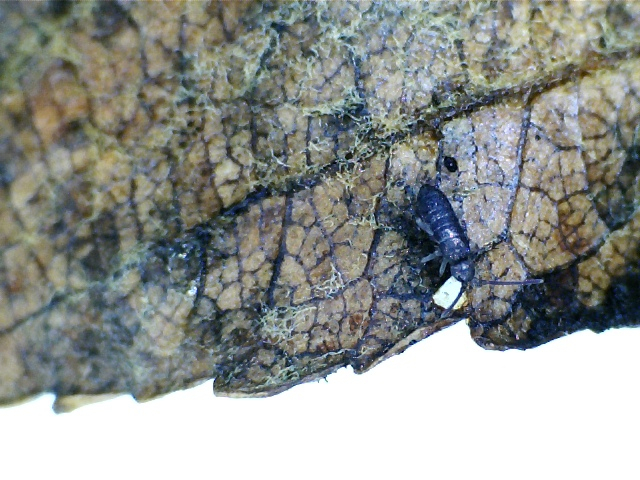 Most springtails have a forked spring folded under their abdome, the furcula, which they can released when disturbed, and gives them their name. 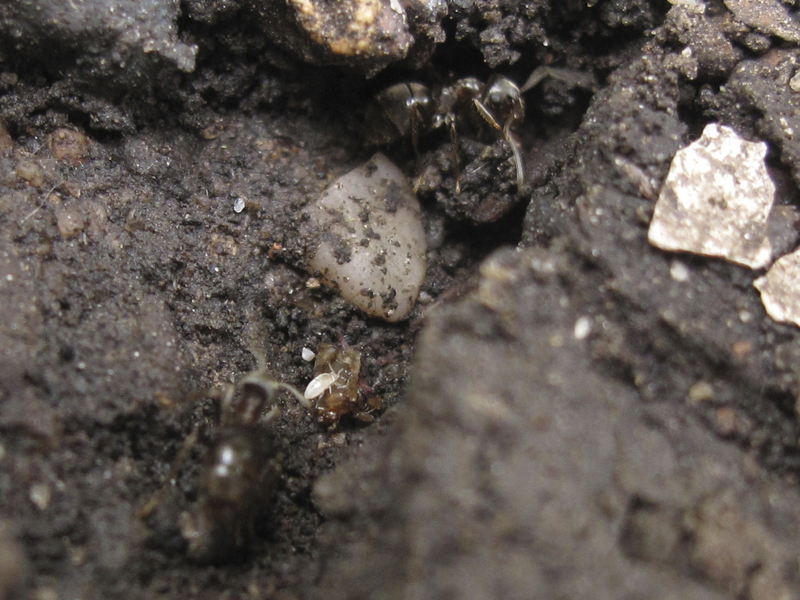 Despite this, some springtails are springless, and many soil living ones have lost all pigment and eyes. Surface dwelling springtails may be covered on iridescent scales, or be hairy and can be surprisingly colourful. There are over 250 sp of British springtails, and at first, that seems a bit discouraging as to trying to identify them. In addition, they can be minuscule! The largest UK springtails are around 6 mm, and the smallest are 0.2 mm, close to the limit of what is visible with the naked eye (especially if you are starting to be a little long sighted!). On the positive side, some of the common species are quite distinctive and with a little practice, identifying others to genus can be done, with a little help of macrophotography. 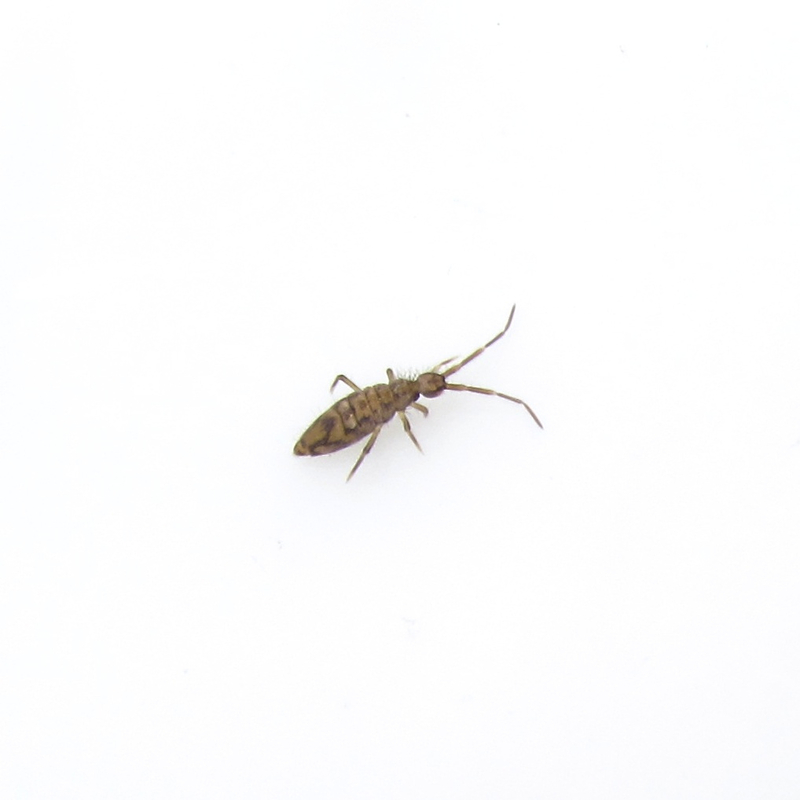 Tomocerus minor, another iridescent springtail. ...when this tiny spider jumped onto the field of vision and ate one of them - just visible at the front of the spider. I wished I had taken a video of that! 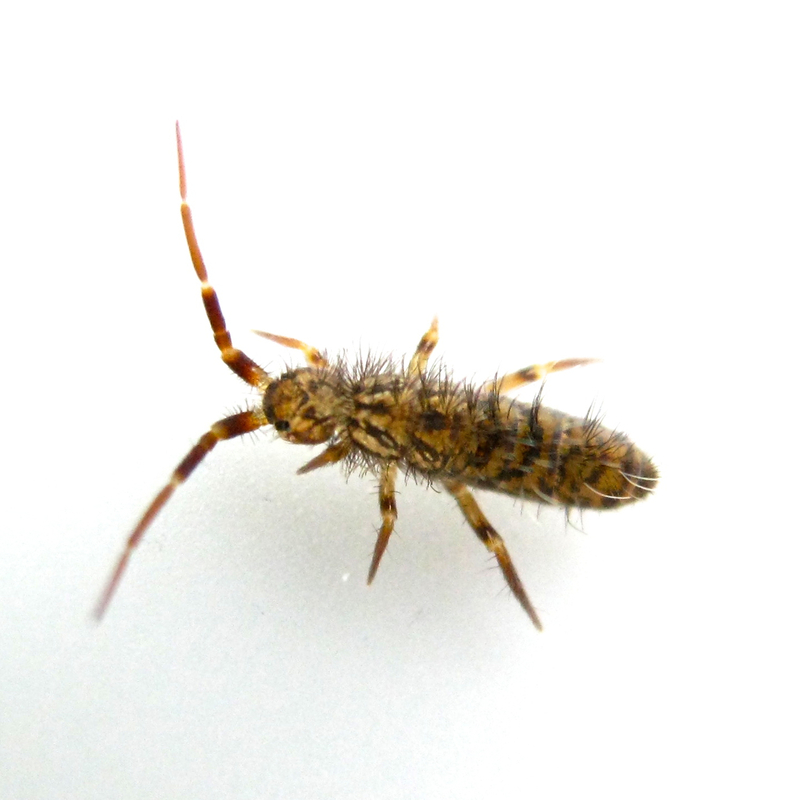 I like to call this species the Lion springtail, as it's got a wonderful mane (also top photo). Orchesella villosa. I often find in on fallen apples (top). Cyphoderus albinus, a springtail often found in ant nests. 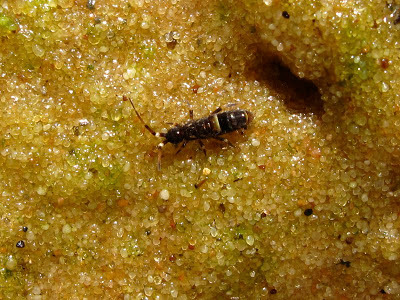 Protaphorura sp. 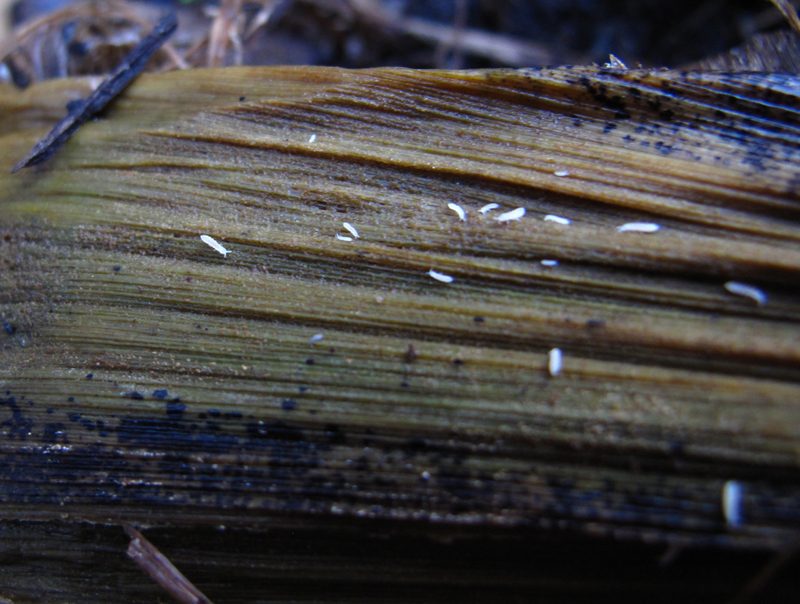 a large aggregation on a rotting plant. 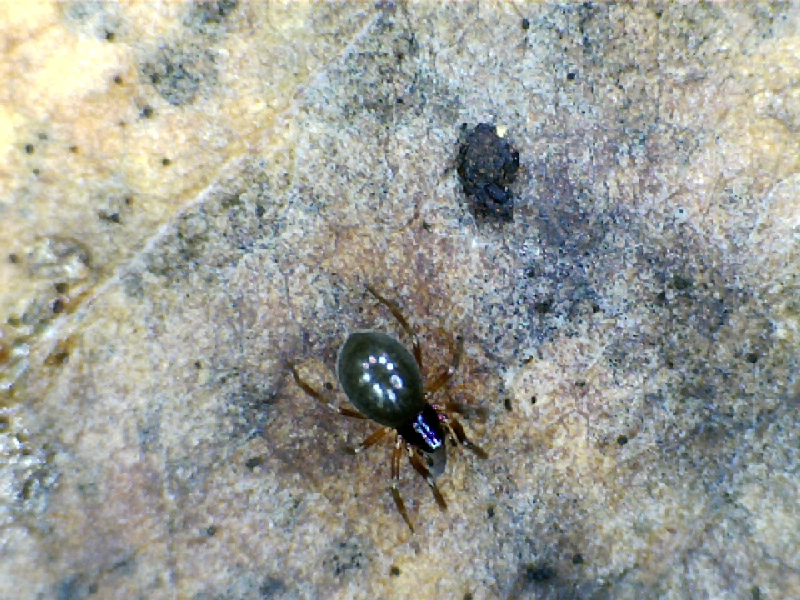 This is actually a springless springtail, as it does not have a furca. Also, as the previous one, it has no eyes or pigment, as they often live underground. 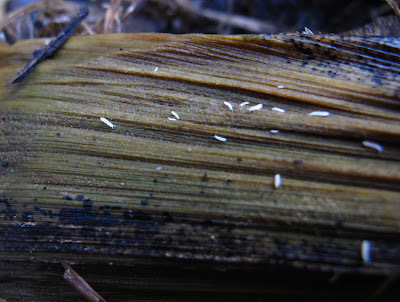 Now I see springtails everywhere. 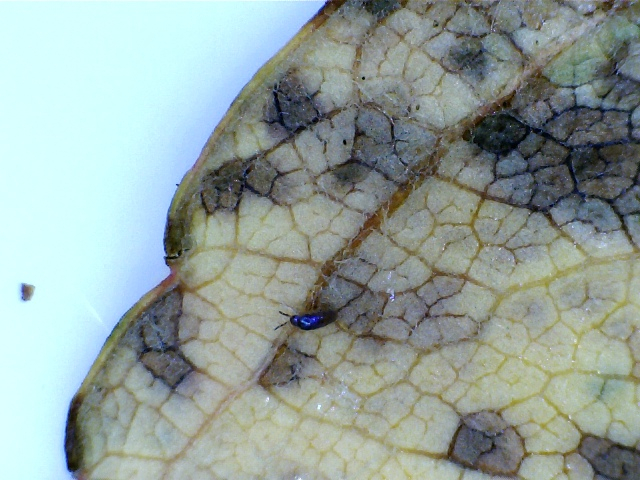 Click to see the full resolution photo and you will notice that there are many springtails - and some bark lice - around these overwintering Harlequins. 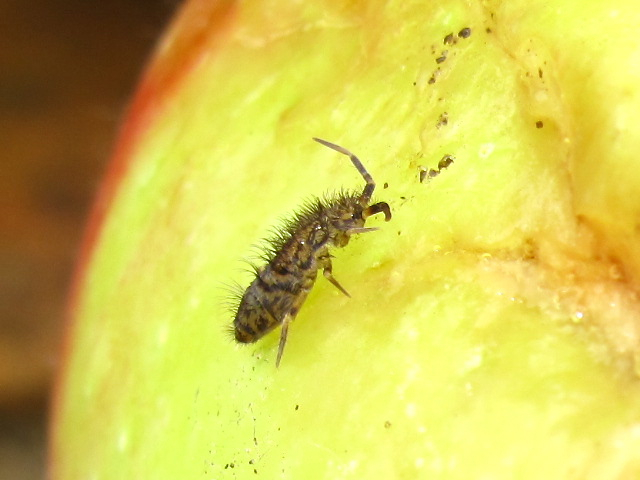 A photographic key to common UK springtails. Collembola of Britain and Ireland. Steve Hopkin's site with distribution maps. 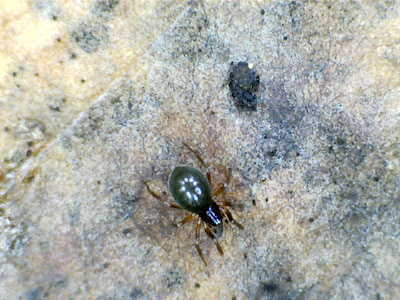 Checklist of the Collembola. With lots of info on springtail biology. Interesting article. I'm very much into photographing springtails, an occupation most of my friends find "quaint". I think they are fascinating and getting down into their world opens up whole new landscapes populated by challenging, beautiful and at times downright scary creatures. 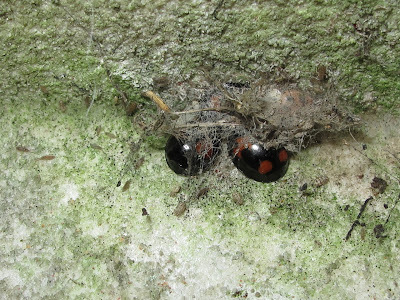 There is a whole ecosystem within a few square inches of my garden, park or woodland.